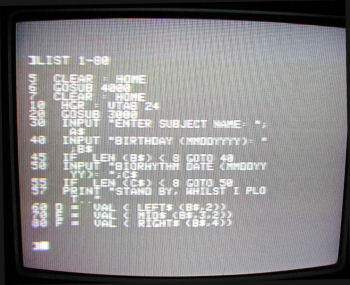 Write a Y2K-compliant Biorhythm program on and for the original Apple II computer, using a vintage color TV. 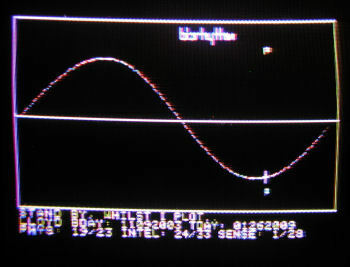 In order to run the program as intended, load Biorhythm on an Apple II 16K through a television by using one of the special RF signal generators made for the Apple II (Click for image). 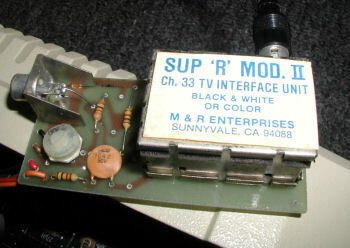 These hacks were sold by third-party companies such as the M & R Enterprises' Sup 'R' Mod. 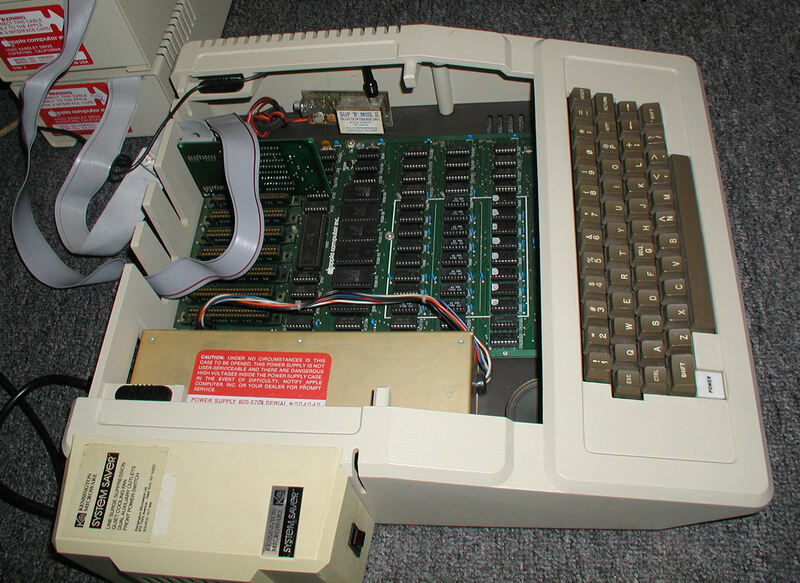 II because FCC regulations, I am told, disallowed the kit to be shipped with the original Apple II. 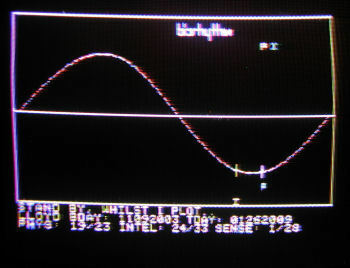 The RF signal generator was connected to a video output circuit on the mother board. The M & R Enterprises Sup 'R' Mod. 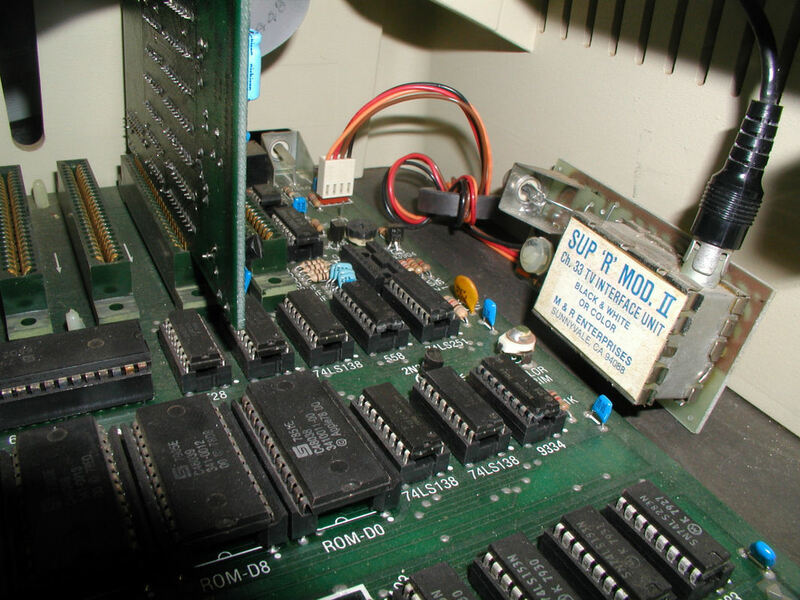 II RF signal generator was attached to the back corner of the Apple II motherboard, near the external video port. The Biorhythm is calculated by taking the total number of days from birth to a future point, and dividing by 23, 33, and 28. These three numbers represent a person's physical (P), intellectual (I), and sensual (S) cycles. On "critical days" a person's P, I, or S crosses the base line of the cycle's sine wave. 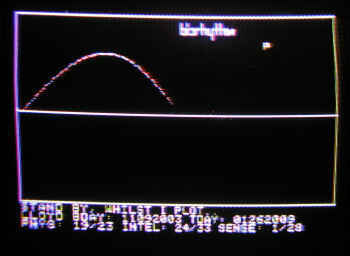 Biorhythm makes use of the hi-res mode available to Apple II, especially the split screen capabilities. There was something special about the way Apple signals interacted with the old color TV sets to produce color and fine details. 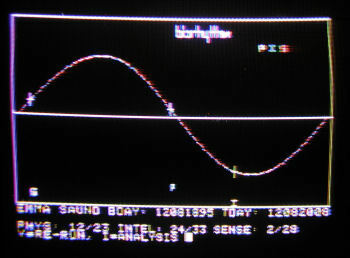 You can run Biorhythm albiet with a less-sharp picture by using the Apple's standard composite video (RCA jack), emulator or LCD. The YouTube.com video shows the program in action, and you can see the forementioned distortions. Also, old TV sets return the scan lines when videoed and you'll see a little bit of that. 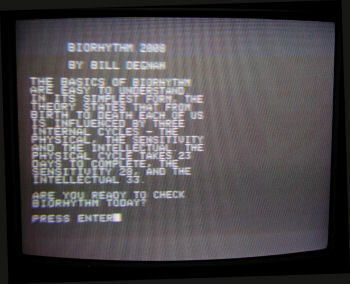 The biothythm program itself was written by me in Applesoft Basic for the 16K Apple II and it took about 30 hours to complete. This does not include finding suitable television. 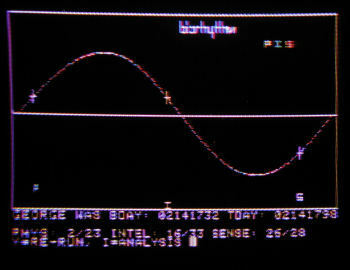 Screen shot of the first few lines of the Biorhythm program. Biorhythm autoloads with DOS 3.2 or 3.3. In theory any date from 0001 to 9999 will return the correct biorhythm, but remember that AD 1752 is when the leap year system was implemented. On-screen directions teach and guide a person through how to generate a biorhythm. 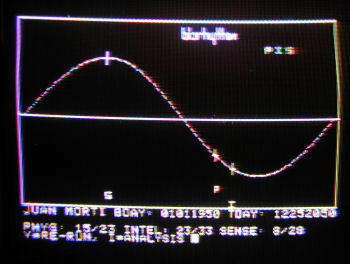 Apple, Atari, Tandy, nor Commodore seem to have offered a Y2K compliant biorhythm. I could be wrong. My version is an attempt to to make a Y2K compliant "classic". 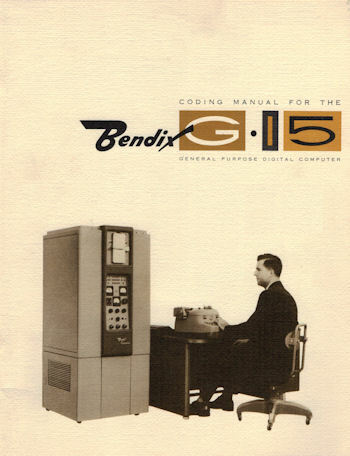 The old programs usually allowed dates from 1901 through 1999. Back then the extra two digits took up valuable memory and non-20th century dates were considered less important. My version will calculate Captain Kirk's biorhythm and other future dates. Knock yourself out. So why is the chick in the video reading the Byte Magazines? There were no Apple brand video monitors until 1980. All of the old ads show people using television sets. 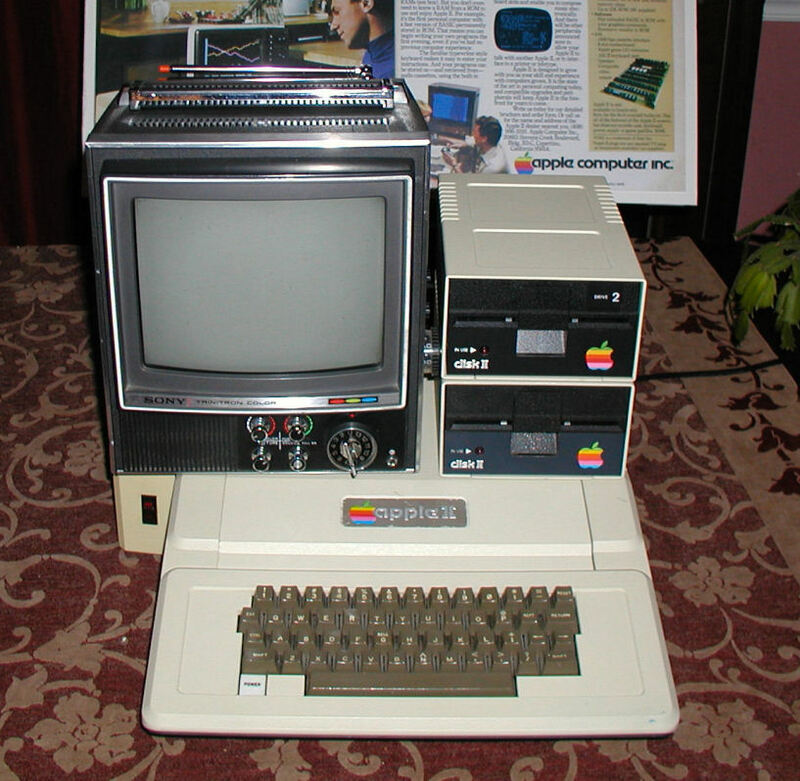 Note in the video there is a poster-sized image of the original Apple II advertisement from Byte magazine. I paired the Apple II with a 1969 Sony Trinitron. 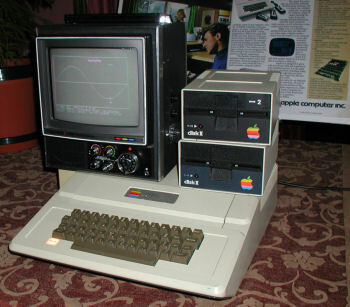 I imagine that most people would have used one of their older tv's for the "new" Apple II, not the main family set. The rear of the system. Note that the RF adapter is plugged into the UHF antenna slot. 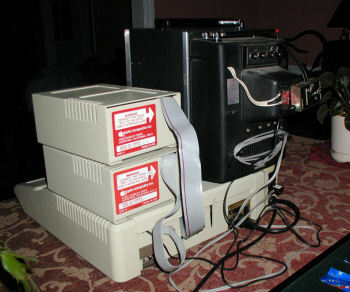 The RF adapter sends a signal to channel 33 on the television set. 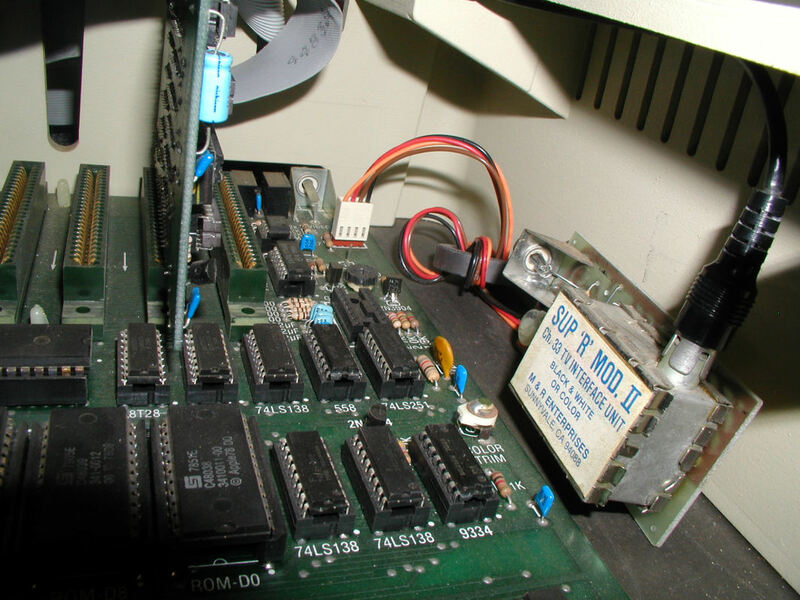 I have for all intents and purposes reproduced how an Apple II would have functioned, looked and been used - in 1978.
port the code to a disk image, post photographs of the RF signal generator, and motherboard. 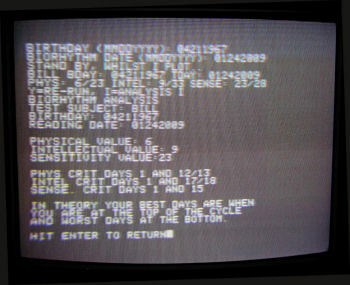 The following are actual screen shots from the Sony Trinitron television. This graph demonstrates the Biorhythm program's capability to span centuries. According to her biorhythm, Emma is both Sensually and Physically critical on her 108th birthday...take it easy Emma! Her Intellectual cycle point is what they call "semi critical" because the slope is changing from negative to positive on this graph. A person enters their birth date and a target date for the biorhythm. 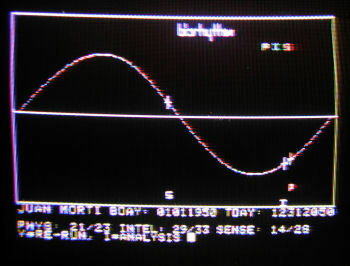 Using these variables, the program calculates the person's biorhythm and displays the matching points along a single sine wave. After viewing the graph, a person can read a brief analysis of their biorhythm scores. 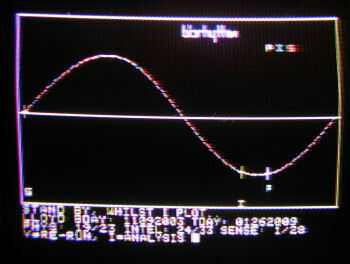 This image displays the program drawing the biorhythm sine wave before any points are plotted. The 23-day physical (P) value is marked with a cross. In this case the physical cycle is "semi-critical" because it is in transition between positive and negative slope. The 33-day Intellectual (I) value is plotted second, and marked with a yellow cross. Because 19/23 is greater than 24/33 the Physical cross is farther along the sine wav relative to the Intellectual. The 28-day Sensual (S) cycle point is plotted and marked with a cross. The sensual cycle is also called the emotional cycle. Six days later, on the eve of Juan's 100th birthday, notice how the faster-moving physical cycle overtakes the longer intellectal cycle as they pass through their respective semi-critial upswing points on the sine wav. The television can be adjusted to tint purple/red. The television can be adjusted to tint blue. I want to thank all of the little people who made this possible.